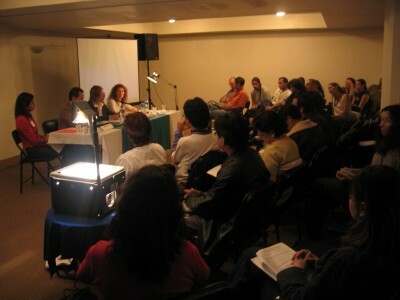 The Primer congreso de purificación cultural urbana de la ciudad de México (First Congress of Urban Purification of Mexico City) was a collaborative project by Ilana Boltvinik and Pablo Helguera made in response to the increasingly conservative climate of government-run cultural policy—or lack thereof— in Mexico. The project took form of an actual conference in the Hotel de la Ciudad de Mexico in downtown Mexico City in May of 2003. The project was never advertised as an art project but as a real conference with a call of papers that insidiously claimed that “culture, like the environment, is polluted”, and invited submissions as to how to “purify” it. Many submissions were received from as far as Colombia, and 6 were selected for the conference, while 6 others were written as scripts and read by actors, unbeknownst to the audience. The 6 “scripted” submissions were in a sense a response to the 6 “real” submissions, formulating statements or points of view that are rarely expressed in academic or public forums. The following two scripted papers here include the one read by the Mexican curator Marco Barrera Bassols, calling for the complete elimination of national arts funding —arguing that most of that funding goes to support a bureaucratic apparatus and too little to actual art making. At the time, Rudolf Giuliani had been hired by the Mexico City government to be a security advisor. The paper read by performance artist Ryan Hill, who was introduced as director of a pro-Giuliani organization, proposed a US-run cultural policy program for Mexico inspired in Giuliani’s own conservative view of culture (not to long ago Giuliani, while New York City mayor, had sought to take away funding from the Brooklyn Museum for the display of Chris Ofili’s painting). 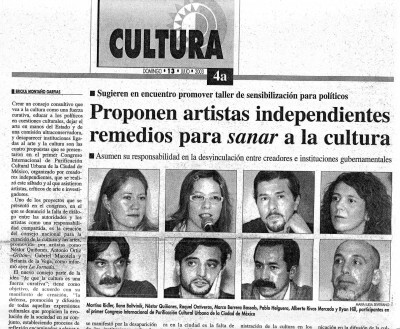 This last paper generated a media blitz and outrage over the notion of an US-led cultural policy, published by the papers La Jornada, Reforma, Universal, Milenio and others, which in turn led to a public debate on cultural policy as originally intended. Thank you for coming today to this event. As assistant director of the department of cultural services and assigned representative of the Rudolph Giuliani Commission for this congress, I would like to start my presentation by speaking about our current positions and our projects related to our improvement of the cultural life of Mexico City. After that, I will get into th specifics of our cultural program, known as PROLICU. As you may or may not know, the Commission is an independent, not-for profit, organism of philantropic nature, which focuses its energies in solving the current problems experienced in Mexico City in what culture is concerned. The Culture Department, which was created at the beginning of 2002, with the intention to increment the range of action of the Commission, is based on the same theorical principles, that is to say, to “condemt and do everything that could be done to abolish all and every one of the abuses towards life and humanity”, followed by various accords such as “ bringing to light and clean all the physically hazardous practices to mental health, and preserving such cleanliness”. Of course, it is of utmost importance to consider cultural practices as part of mental health. From its very beginnings, the members of the commission have made an uninterupted stand against the brutal treatments and criminal practices and abuses against social and cultural human hygiene, following as its main principle the emphasis of moral renovation implemented by Rudolf W. Giuliani as major of the City of New York. The Commission has become a really effective force in the promotion of changes in this area. Our program known as PROLICU is dedicated to the research and identification of any violations to cultural hygiene, both in the psychiatric and physical sense. Although it is a relatively young organization, it has already accomplished a profound cultural study with the help of many national and international experts in order to present, in the most complete way possible, the action plan that we plan to follow to implement the cultural cleaning of this city. I will now describe the Program of Cultural Cleanup (PROLICU) in its first stages and Characteristics. The international program for the cultural purification of Mexico City, better known as PROLICU, was launched in 2002 by the Commission. The project, carefully developed with the objective of completely reforming the life of Mexico City through a thorough cultural cleanup, consists in a series of key steps that need yet to be implemented. The general comission of PROLICU, composed by those members of the government who may consider themselves knowledgeable in the field of arts, will carefully analize the cultural program of each one of the city’s museums, houses of culture, universities, schools, galleries, and activity centers open to the public, identifying where they can, those instances in which the activities may be considered immoral — which is not the case of every institution, although it is estimated that 78% of cultural centers in Mexico City have such condition to some extent and need of profound renovation in this aspect. All the directors, curators, museum administrators, and employees of government-run galleries, cultural centers and community centers whose cultural discipline and challenge to authority will be immediately dismissed, without any previous notification. Those cultural producers and/or administrators who would participate in works supposedly of an “artistic” nature that would not follow the previous rules, will be immediately subject to fines and quotas of up to $10,000.00 U.S. dlls. Additionally, any other work that would be considered to make reference, either directly or metaphorically, to any slanderous attack of political, social, religious or economic nature will be confiscated and examined by the CoMoDePu until deemed appropriate or not for public viewing. Exempted from this rule are all the artists and creators who may have received lifelong scholarships by CONACULTA. The Commission will simultaneously establish a renovation program in the artistic curriculum in Mexico City schools, in collaboration with the Ministry of Education. In this program, ellaborated by experts, the lacks in the current educational system will be addressed and there will be special classes given for the training of future artists. 3) Collaborations with international institutions that are not sanctioned by the government. 3) exhibitions, lectures, and events by government-approved artists.